A crispy, cheesy and flavorful appetizer. Spray a large frying pan with cooking spray and fry Italian Sausage into crumbles over med high heat until cooked through, about 5 mins. Transfer onto paper towel to absorb excess grease. In a medium sized mixing bowl thoroughly combined egg, ricotta and garlic powder. Spray 2,12 cup muffin tins with cooking spray. Layer two wonton wrappers per muffin cup. 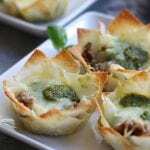 Place approximately 1/2 tbsp sausage, 1/2 tbsp ricotta, 1 tsp pesto and 1 tbsp mozzarella into each muffin cup. Bake in a preheated 375℉ oven for 10 mins. Serve immediately. *Please use as many organic ingredients as possible. * This recipe was inspired by Meatloaf and Melodrama.